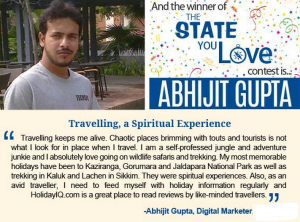 And the winner of the “State You Love” contest is Abhijit Gupta…! Yes, ultimately I have been declared the winner. The contest named “The State You Love” organized by HolidayIQ is over and surprisingly I have been announced the winner of the contest. It is really a great feeling that people across India have loved my review on Sikkim and voted for me. I have been reviewing many places of interest and tourist destinations on my blog www.traveldias.com and many other platforms like travel forums, communities, groups etc. Though I have gained recognitions from several platforms but this really special. I didn’t expect it and I never tracked the contest but finally when a mail shoots in my mail inbox declaring me as one of the top 5 finalist, I was really eager to win the contest then. The review on a place or region with highest number of likes on the Facebook page of HolidayIQ was supposed to be declared the winner of the contest and finally the likes came on my way declaring me the winner. I wrote a review on Sikkim – my favorite destination in north-east India. 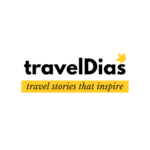 I wrote it without any interest but to help travelers like what I have been doing since long. When I came to know that a popular travel portal has introduced review sections on its site, I thought the travelers who are attached to this portal and looking forward to visit Sikkim will surely need information and guidance. So I just posted my review with an intention to help other travelers. When I came to know that I had been declared one of the top 5 finalists, I knew I have to win it. By the grace of God I got most number of likes and here I am as the winner of the contest. I thank all the people who voted for me and helped me to win this prestigious title. I am really feeling proud to be a top reviewer of Sikkim – my favorite destination in north east India. I thank Holiday IQ for organizing such a wonderful contest, looking forward to such more contests in future. I thank all the persons who appreciated my work. Congrats! HolidayIQ recognized you at last. You are steady and giving a good opinion based info (i named it ‘infonion.’) without leaving anyone empty stomach. May your passion and interest grows with time. Thanks Sandip…! Appreciations are always encouraging. We are planning to visit zuluk and around probably on the second week of October. Please let us know how far it is feasible. And also inform about the natural beauty around that time. I have gone through your website. But I can’t find any on October specialy. If you kindly reply to me, I will be very grateful to you. Thanks with regard. It is absolutely feasible to visit east Sikkim in October. Weather will be fine and sky will be clear enabling you to view the amazing and breath taking scenery all around. October is a peak time so book your accommodation and vehicle in advance. Lodging facility and vehicle in east Sikkim is very limited. For further details and if you need any more help, do mail me at “uvreachedavi@gmail.com”. I can surely help but which place you are talking about. Give me a call on my mobile after 9 pm any day if you want to discuss.